The Japanese manga and anime sensation about pirates, One Piece, is very popular here in China—so much so that it almost spawned a theme park. 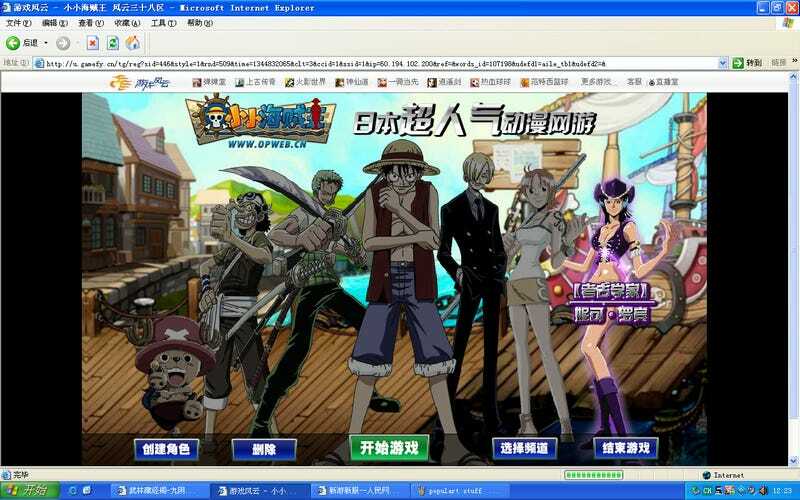 Perhaps it is because that I that I actually enjoy One Piece that I found its latest offering in the form a Chinese licensed (which may turn out to be fake) online browser game to be extremely appalling. The game, Tiny Tiny Pirate King, is pretty much a browser based, One Piece themed Maple Story. The player can choose to from four classes of pirate from a navigator to a swordsman. Interestingly enough the character artwork looks nothing like anything found in One Piece . In regards to the end-game, the point of the game is to rack up points and levels to become the pirate king. The story follows the anime and manga but only loosely. There are occasional quests in which the main cast from One Piece show up to help and many of the non-playable characters are familiar faces to fans of the series but they can't save this game and I'll explain why. For game that supposedly has a battle system, there is no battle. No combat. No battle, no fun. Basically all you can do is run the character left and right. I spent about 30 minutes trying to figure out what exactly to do, but the only thing that can be done is moving the character around the screen. Once a battle is started, the AI automatically dishes out turn based combat between you and the enemy. After about a minute, the battle is over and pending on your stats you win or lose. This game is like a glorified One Piece skinned game of rock paper scissors. Trying out this game has robbed me of my time, my life, and my affection for the One Piece franchise. I sincerely hope that I'm wrong and that I'm being a complete idiot and that there is some redeeming feature to this game (there are a lot of images and video of what looks like fun online...). It's not often that I hope a game is truly a rip-off, but this time I am praying to the high heavens that this game is an unlicensed fraud that is waiting to be shut down.